If you are looking for the perfect gift for a serious gamer, you need to take a look at this Cyborg Robotic Gaming Keyboard I found at ThinkGeek.com . If this sought after keyboard happens to be out of stock, you can always give a ThinkGeek gift certificate in its place until they are back in stock. 1) Beyond the customizable features, this keyboard is of the highest quality. 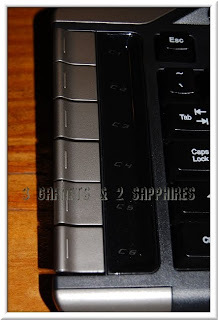 The keys are solid, smooth, offer the perfect resistance and are extremely quiet during typing. 2) The extra large wrist rests offer comfortable support through many hours of gaming. 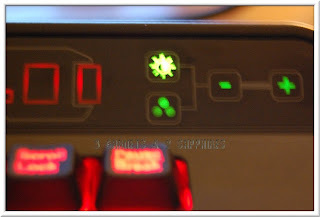 3) There are 12 macro keys, which is more than one would usually find on a gaming keyboard. One thing that is nice about these macro keys is that they are located on the left and right ends of the keyboard, making them accessible, but at the same time keeping them out of the way. 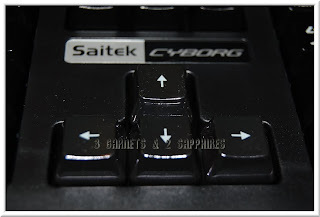 Many gaming keyboards have macro keys located above the function keys, which sometimes leads to their getting hit unintentionally. 4) One of the things my husband is most impressed with is that the most widely used keys are metal coated. 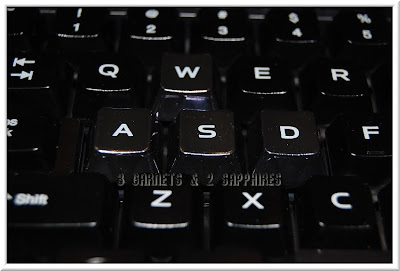 This includes the "WASD" keys, the space bar, and the arrow keys. At first my husband was concerned that these keys would be slippery, but they actually are not. 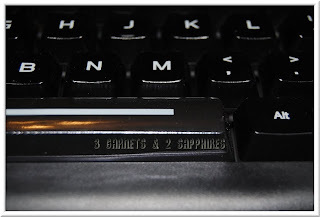 He does suggest that the next version of this keyboard include a metal coated "return" key. 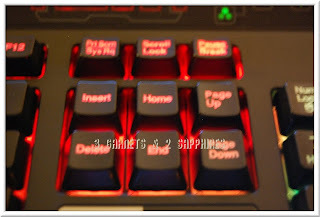 5) If you use your computer for different types of media, there is a touch-sensitive dashboard at the top of the keyboard made just to control volume and other media functions. 6) When the keyboard is not in Cyborg mode, it is just an extremely nice keyboard. 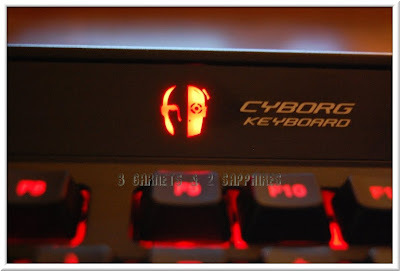 When the keyboard switches into Cyborg mode, all the Windows keys turn off and the macro or "Cyborg" keys turn on. 7) All the Cyborg features are conveniently controlled with another touch-sensitive dashboard on the other end of the keyboard. 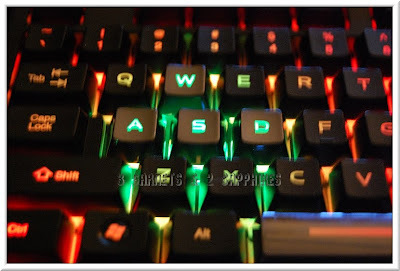 8) One of the customizable features is the ability to set various sections of the keyboard to be backlit in different shades and levels of brightness of reds, ambers, and greens. These sections include the "WASD" keys, the arrow keys, the number pad, and the Cyborg control center. This has a high coolness factor, but is only really useful if the gamer is playing under low light conditions. 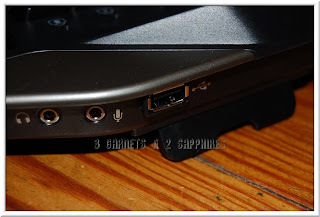 9) When the gold-plated audio and microphone sockets in the back are used, the user can control the volume, etc . . . with the previously mentioned multi media dashboard on the front. 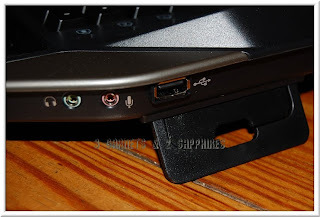 10) The gold-plated USB socket on the back of the keyboard is a pass-through USB, which means that plugging a device into this socket would be the same as plugging it into your PC tower, therefore not taking any power from your keyboard. 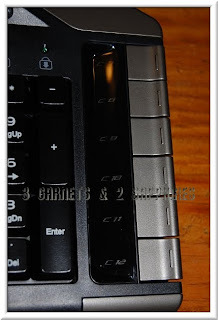 11) The last customizable feature I would like to point out are the lifts on the back which angle the keyboard up. There are two heights in which the user can set the angle. This is particularly nice if the gamer takes his keyboard with him to play on different surfaces. 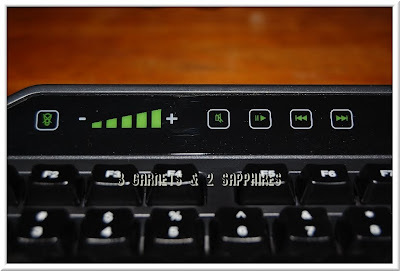 Of all the items my husband has helped me review in 2009, I would say that this keyboard may be or at least is close to being his favorite product. 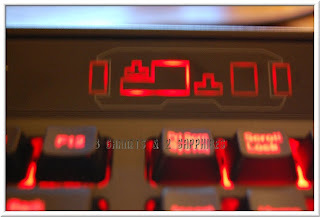 He would also like to make it known that the Cyborg Robotic Gaming Keyboard would be ideal for dual-boxing, which means playing two different games on 2 computers, with only one monitor and one keyboard. 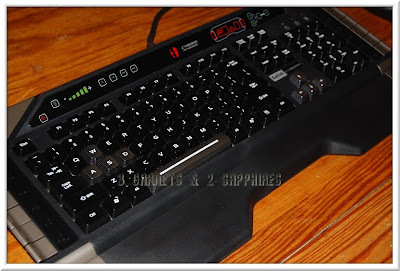 You can find this Cyborg Gaming Keyboard at Think Geek among some other very cool products for children and adults. Be warned! . . . You might find yourself spending hours browsing through this website. 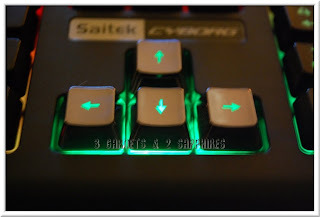 Thank you to Think Geek for providing a keyboard for this review.